Wannon Shire (1872-1994) was in western Victoria, occupying an area known geographically as the Dundas plateau, in a sense the most westerly foothills of the Grampians. The shire’s eastern boundary coincided with the Rocklands reservoir, a storage filled by westerly streams from the Grampians. The streams converge in the Glenelg River (the shire’s northern boundary) which flows along the base of the plateau before crossing the Western District in a southerly direction. The Wannon River (also fed by the Grampians) defined the shire’s southern boundary, before entering the Glenelg River. The shire’s western boundary was about 45 km from the South Australian border. 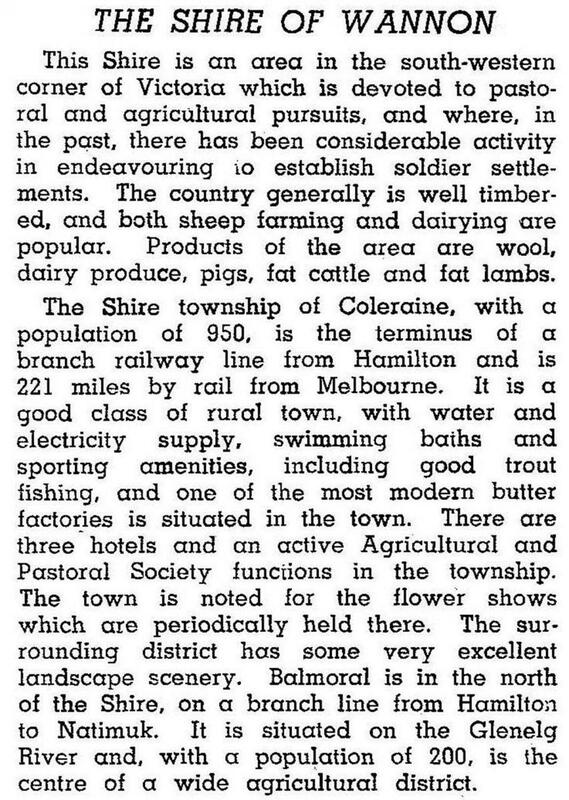 Its main town, Coleraine, was in the south of the shire, positioned on the Glenelg Highway and at the end of a railway (1888-1977), both from Hamilton. In 1836 the New South Wales Surveyor General, Thomas Mitchell, named the Wannon River during his Australia Felix expedition. It is thought that the name was derived from an Aboriginal word meaning a digging or throwing stick. The Wannon River passes through some scenic landscape, including the Nigretta Falls and the Wannon Falls south-west of Coleraine. The shire’s mainstay proved to be sheep grazing. Dairying and sawmilling were active for a short while, but by the 1990s were much reduced. In 1994 farming occupied 95% of the shire’s area of 1977 sq km. There were 936,000 sheep and lambs and 36,000 meat cattle. On 23 September 1994, Wannon shire was united with Hamilton city, Dundas and Mount Rouse shires and a small part of Heywood shire to form Southern Grampians shire. The new shire headquartered in Hamilton, and has no office in any of the former shire centres.